A lot of entrepreneurs usually focus on the WHAT, especially when it comes to growth. WHAT’s the best growth hack to grow my startup? WHAT’s the latest growth hack out there? WHAT are growth hacks for Instagram, Facebook, blog, or [insert customer acquisition channel here]? The problem with focusing too much on the WHAT of growth hacking is that it often leads to meaningless growth. You’re growing for the sake of growing. It becomes a vicious cycle of acquiring more users without achieving meaningful and purposeful growth. The Wheel of Meaningless Growth by Brian Balfour. Read this post here. The founders then celebrate the press coverage or praise from investors internally. This sends a message to the rest of the team that their goal is to pursue vanity metrics. 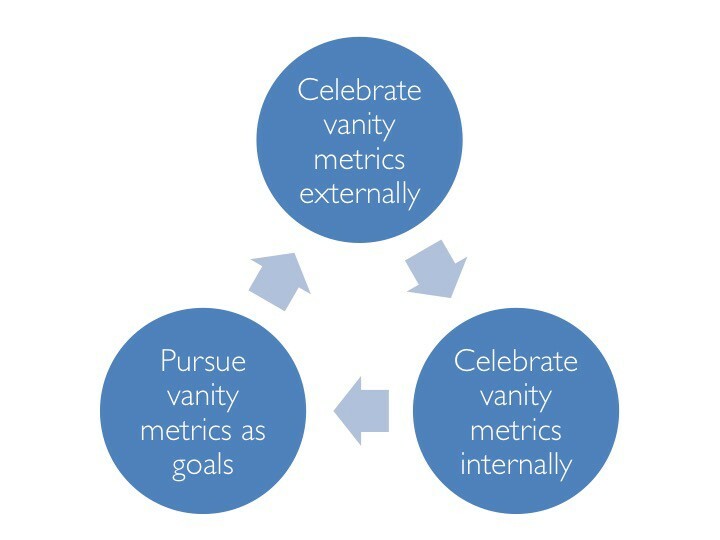 In order to keep getting attention from the press and investors, they focus on increasing the vanity metrics (back to step 1). This cycle seems harmless. You are getting press, right? 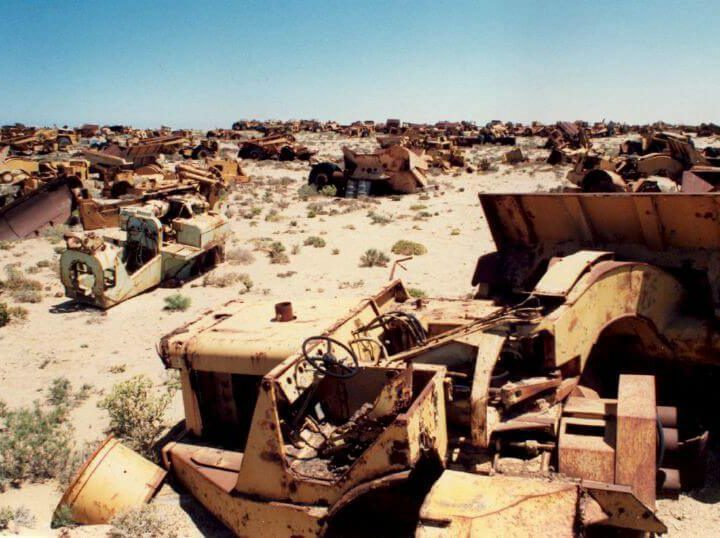 But, pursuing meaningless growth wastes valuable resources that most startups don’t have. Next thing you know, it’s game over. To end the pursuit of meaningless growth, you need to stop focusing on just the WHAT, and start with the WHY, then HOW. It all starts with Why. The WHY of growth hacking is your product vision. Before you even start thinking about what growth hacks to use or how you’ll grow your startup, you need to first know where you are going with your product and who that product is for. As your product matures from a new product to product/market fit, your growth strategy and tactics change (more on that on this essay). 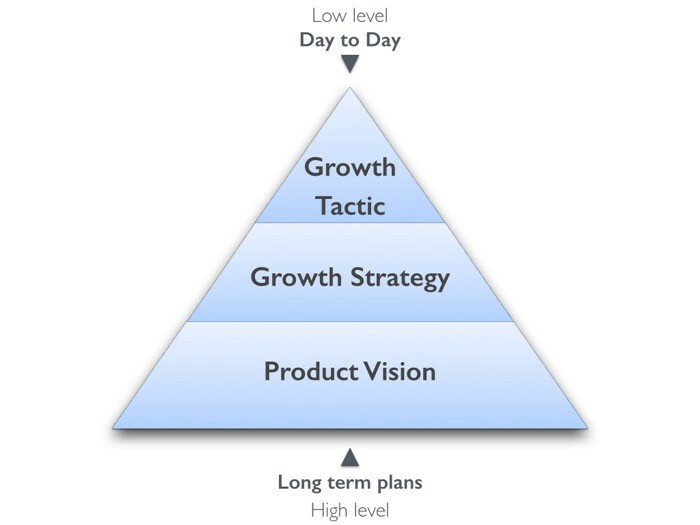 Your product vision directs your growth strategy and tactic. It helps you determine which growth strategies and tactics you should or shouldn’t employ. The HOW is your growth strategy. Once you know where you are going, you need a large scale plan to get your first 100 customers to validate product/market fit, then scale to 1M+ users when you’re ready to scale. I adopted Eric Ries’ three engines of growth: sticky, viral and paid. The WHAT is the growth tactics you use to accomplish your growth strategy. Some people call this as growth hacks. These are daily or weekly activities you do with your team to achieve your growth goals. Before I give an example of this, let me first go into a little more detail into the product vision and growth strategy. The product vision is how you envision the world with your product or service. The product vision doesn’t just guide your product but, especially before product/market fit, it should also guide your growth strategy (HOW)and growth tactics (WHAT). Who is going to buy the product? Who is the target customer? Which product attributes are critical to satisfy the needs selected, and therefore for the success of the product? If you have not achieve product/market fit, all of these will be assumptions. Remember, there are different growth stages for startups. 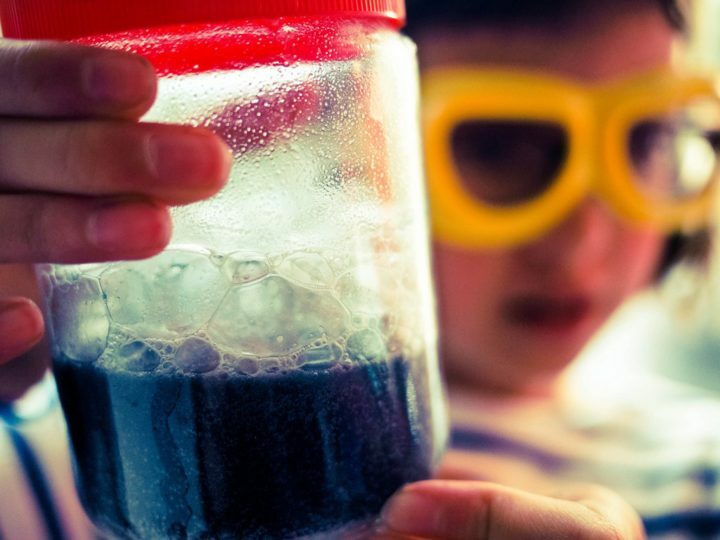 You’ll use experiments to validate these assumptions into facts. Once you achieve product/market fit, you have now more clarity as to who your customers are and how your product addresses their unmet needs. 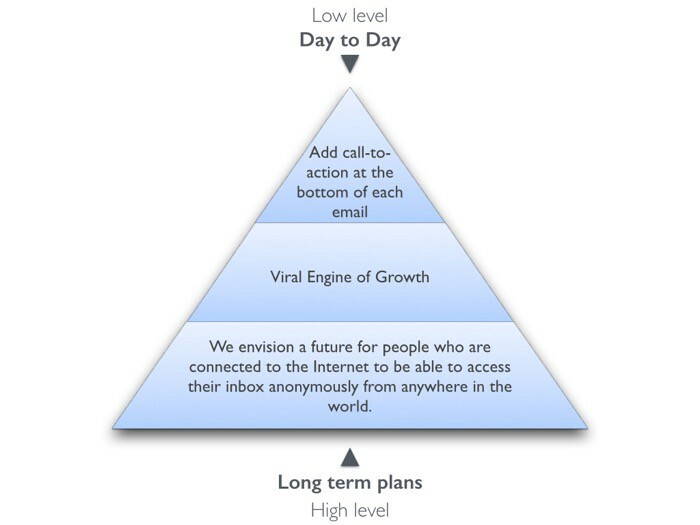 For the growth strategy, I adopted Eric Ries’ three engines of growth: sticky, viral and paid. 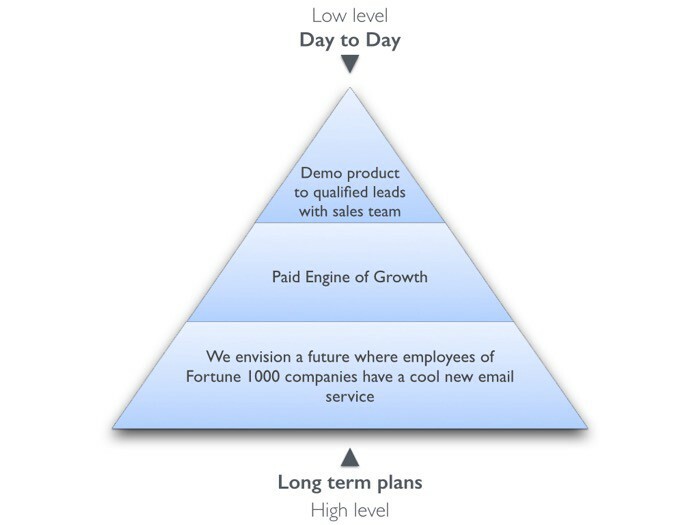 If you’re not familiar with the engines of growth, read on. If you are, skip to the next section Putting It All Together. The Viral growth strategy focuses on adding viral hooks into your product to fuel the viral loop. The viral engine of growth causes growth to happen automatically as a side effect of customers using the product. They do not need to be evangelizing or even actively recommending the product to their friends as is the case with word-of-mouth growth. The Paid growth strategy focuses on “paying” to acquire customers, whether it’s purchasing ads, employing sales teams or leasing expensive real estate for foot traffic. As long as you’re making a profit on each customer, you can invest those profits into more advertising to accelerate growth. For early-stage pre-product/market-fit startups, it’s much better to focus on one growth strategy at a time. If you’re trying to go viral, make your product sticky, and pay for customers, it’s going to get very difficult to figure out what’s working. How does your product vision relate to your growth strategy and tactics? Your product vision should help you determine which growth strategies and tactics you should and shouldn’t employ to achieve your growth goals. As a B2B product, it’s much easier to start charging as soon as possible, since most companies have a monthly budget for tools and services. So the Paid growth strategy could work well it. You could recruit a 3rd party sales team to get qualified leads for you. On the other hand, let’s say you’re Sabeer Bhatia and Jack Smith and you have an audicious goal in 1996 for almost everyone to have free access to email anonymously around the world. You probably shouldn’t employ the Paid growth strategy. The economics wouldn’t make sense. Email is inherently social. To send an email to someone, they need an email provider. Email providers have high retention and usage. It’s a product that anyone with Internet access can use. This is probably why it’d made sense for Hotmail to add call-to-action to sign up for a Hotmail account at the bottom of each email, “Get your free email at Hotmail.” This implied endorsement fueled the viral loop. The receiver of a Hotmail email account see that his friend is a Hotmail user and it’s free. Notice how the enterprise email service and Hotmail both have the same product but differentproduct vision. Thus, both have different growth strategy and tactics. His response digs deeper than the shallow WHAT of growth hacking. It goes to the WHY. The Why is answered by your product vision. At the end of the day, the dream of every startup is to build a sustainable business. And you achieve this dream with your product vision. Sean Ellis once said that a growth hackers true north is growth. But growth for growth sake is unfocused, ineffective and unpredictable. If you really want your growth to be effective, deliberate and purposeful, your growth needs to be guided by your product vision and growth strategy.